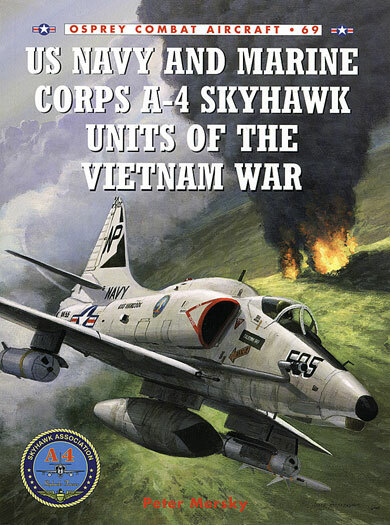 US Navy and United States Marine Corps A-4 Skyhawk Units of the Vietnam War is the latest release from Osprey Publishing and is number 69 in their Combat Aircraft Series. This book is the fourth authored by Peter Mersky for Osprey Publications. His other contributions to the Osprey Combat Aircraft Series also deal with the Vietnam conflict and the US Navy and Marine Corps aviation’s involvement in it. His other titles - US Navy A-7 Corsair II Units of the Vietnam War (co-authored by Norm Birzer), RF-8 Crusader Units over Cuba and Vietnam , and F-8 Crusader Units of the Vietnam War were all well researched, well written and provided the reader with more than just the “big picture” summary. I am pleased to advise that this latest title is equally as good as its predecessors. It faithfully covers the unit’s flying the A-4 in this conflict from the initial sorties in August of 1964 right through to the final missions in January of 1973 and everything in between. 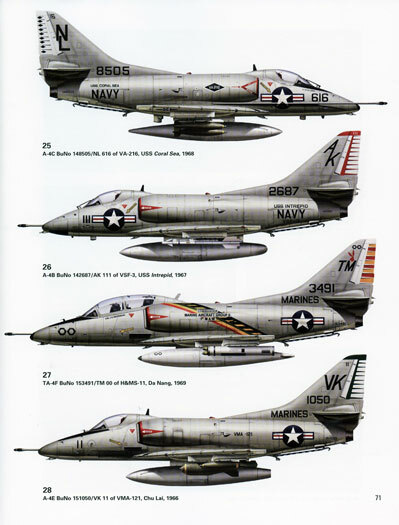 United States Marine Corps A-4 Skyhawk Deployments to South East Asia from 1963 to 1975. In the same format as above. Scale drawings by Mark Styling (in 1/96 scale) of an A-4E ‘humped and non- humped’. Captions to the 13 colour photographs. The book also contains twelve pages that hold 33 colour profiles. These profiles have been beautifully painted by Jim Laurier. Further artwork appears on the front cover, this time by Mark Postlethwaite. The book is also very well illustrated with both colour (13) and black and white (94) photographs. Hard bitten fans of US Naval aviation will recognise some of the photographs but there are also a large number that have not been seen in print before (at least by me). The book itself has 112 pages printed on glossy paper between thin cardboard covers and is the same size as the Aircraft of the Aces and Combat Aircraft series produced by Osprey. As a fan of US Naval aviation and of the A-4, I found this to be an excellent book. It provides a blow by blow account illustrated throughout with first person narratives of pilot’s experiences of the ‘Attack Communities air war in Vietnam. Thoroughly recommended and well and truly worth the price being asked of it! Whilst this book is more aimed at the enthusiast than the modeller I did find it helpful with its explanations of what configurations the A-4 carried in offensive armament against the different targets it flew against.